If you're one of the millions of homeowners who use propane or heating oil to warm your home during freezing Northern winters, one of the biggest headaches of the season is likely checking the status of your oil. Heating oil is an essential element of your home. But many people fail to upkeep this crucial system. Particularly during the holiday season, oil tanks get lost in the hustle and bustle of vacations, gift-shopping sprees and family dinners. Unfortunately, this time of year is also the beginning of winter, when a full oil tank is most critical. As a result, even the most responsible homeowners run out of fuel during the cold winter months when they need it most. No matter the reason, running out of propane or fuel oil is a frustrating experience and can significantly impact your wellbeing and day-to-day function. But prevention doesn't have to be a nightmare. You can ensure that your tank stays full year-round by understanding the risks of running out of fuel and taking simple measures to avoid an empty fuel tank. You might think that a lack of preventive measures is no big deal, especially if you've never run out of oil before. But even the most careful people sometimes forget to place their order on time — a problem more harmful than it might initially seem. In fact, several pressing reasons make purchasing your oil on time a necessity. Apart from the obvious inconvenience of a cold home and a lack of hot water, the following are just some of the risks that can occur if you don't take preventive measures to keep your oil tank full. Homeowners most commonly run out of heating oil during the middle or end of winter. Unfortunately, this also coincides with the highest heating oil prices of the year. When you run out of fuel between October and March, you end up paying the highest rates of the heating oil season, which can add up to hundreds of extra dollars. Then, not only will you pay more for the oil itself, but you'll spend far more on an emergency delivery than you would for a regular fill-up. Small fill-ups throughout the year will cost significantly less overall than an emergency service. Sludge and debris are commonly found at the bottom of heating oil tanks. But they don't typically damage your heating oil system — unless your tank is empty, that is. When oil levels are low, the sludge gets pulled into the supply line along with the remaining oil. If it doesn't clog the line, it'll get transported to a filter, which it will clog either partially or entirely. Plugged fuel lines or filters will result in either reduced efficiency or a complete system shut-down that will need to be addressed by a professional. Sometimes, resetting your propane or heating oil system after a run-out is as simple as the press of a button. But if the pilot light goes off, you'll need a pilot light reset. By law, a professional must perform the pilot light reset. He or she will bleed the oil line and change any plugged filters, which will cost you hundreds more than a simple oil fill. With the many risks associated with running out of propane or heating oil, why wait any longer to ensure that you're protected? Take charge of your home and its heating needs by taking the preventive measures necessary to keep oil in your heating tank all year long. With automatic delivery services, you never need to worry about running out of oil again. And the best part? You don't even have to do any work. No more checking your tank and calculating when you should schedule a refill. An automatic delivery program lets you sit back and relax while your oil company takes care of it all. 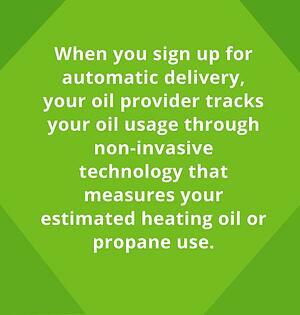 When you sign up for automatic delivery, your oil provider tracks your oil usage through non-invasive technology that measures your estimated heating oil or propane use. They use simple information about your home and family combined with calculated heating degree days (HDD), which are a measurement of how much energy is required to heat your home based on the outside temperature. When your provider calculates HDD with your home's square footage, the size of your fuel tank and previous data surrounding your heating needs, they can determine with high accuracy when your tank will reach one-quarter full. At that time, you'll be contacted directly to schedule a delivery. Automatic delivery is the most popular delivery method for most heating oil companies and has a high success rate in preventing empty fuel tanks. These deliveries save you the most money out of any preventive option. Most providers reward customers with discounted oil prices for signing up for the service, which adds up to as much as $200 a year. The system is based on your previous heating history and makes deliveries based on your unique needs, so you won't be sold oil you don't want or need. Non-intrusive calculation methods ensure that you don't have to worry about invasive tank monitoring software. This system doesn't take into account unexpected increases in heat. If you have visiting relatives over the holidays who use a lot of hot water in the shower, or if you went on vacation and didn't use as much heat as normal, you'll have to manually let your oil company know so that they can adjust your delivery schedule. For the most accurate results, you'll likely need to agree to a commitment with a single supplier for a certain amount of time and won't be able to shop around for different prices throughout the year. Smart technology has penetrated nearly every possible industry. From smart security systems and thermostats to garbage bins and cookware, no part of the home lacks technologically advanced alternatives. This technology has also made waves in the heating oil industry with the introduction of smart oil tank meters. Instantly monitor your home's oil levels, consumption and heating costs from your living room or from 1,000 miles away with smart software. This tracking method sends data to your phone or computer via a sensor that attaches to your oil tank. No professional installation is required. Just place the sensor on your tank according to the directions, and you can track your usage within minutes. Alarms built into many systems notify you of potential oil theft. Most smart systems alert you as soon as oil levels get low so you have time to notify your supplier. Smart meters are one of the pricier oil tracking options available. A smart tank monitoring system typically costs around $100 or more. Reports of errors from smart monitoring software have gained attention from media outlets who described rare cases of up to 50% inaccuracy in electricity monitoring systems. Although most users of smart oil monitoring software find the system accurate, these rare inaccuracies should be considered and checked for. Most smart meters only notify you — not your supplier — to low oil levels. You'll still need to call your oil provider as soon as possible to ensure you won't run out of oil. If you're interested in checking tank levels from the comfort of your home but don't have a smartphone or other device to connect to a smart meter, local tank monitoring software provides an ideal alternative. Similarly to smart meters, local tank monitors feature a transmitter that easily attaches to your oil tank. The sensor sends a local read-out to a monitor, which is typically plugged into an electrical socket in your home. Most monitors are quickly installed by placing the sensor in the tank and plugging the monitor into an outlet. Non-smartphone users can still enjoy the benefits of a tank read-out system with ease. The system sends an alert to the monitor when oil gets low, so you don't have to guess when you should call your oil provider. Local tank monitors are more accurate than traditional mechanical float gauges and can replace the need for gauges or dipsticks altogether. While some monitors can be placed throughout the home, many must be installed within a certain distance of the tank, giving you less freedom than smart meters or automatic delivery services. Likewise, while some mobile monitors run off of a battery and can be taken throughout the home, most local tank monitors are powered through an electrical outlet and lack mobility. Tank transmitter and monitoring systems cost nearly as much as smart monitoring software. 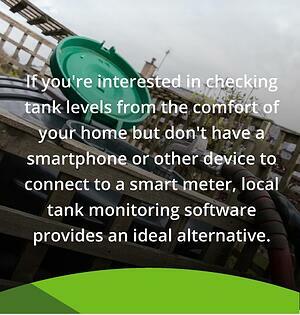 Like smart meters, you'll spend around $100 on a local tank monitor. Although the system typically sends an alert when the tank is low, you'll still need to call your oil supplier last-minute for a refill. Do you want a system that alerts you to low oil levels without all the bells and whistles of a smart or local monitoring system? Look no further than an oil tank alert system. With an alert system, you won't pay for any extra data or settings. You'll merely install a gauge onto your oil tank that sends an alert to a receiver when your oil levels get low. The receiver beeps or flashes when oil levels reach a set amount, letting you know when you should call your oil provider. Alert systems are an ideal monitoring solution for homeowners unfamiliar with smart technology. The receiver — a simple device lacking a screen or complicated user interface — alerts you to low oil levels without any unnecessary added information. Because of their simplicity, alert systems are a relatively inexpensive alternative to other tank monitoring software. You can purchase a unit for less than $100. Many receivers are battery-powered and can be placed nearly anywhere in your home. Alarm systems notify you when levels are low, but they fail to provide important data about your oil usage. Knowing your seasonal and daily trends can help you pinpoint exactly where money is being wasted and what you can do to lower your heating costs, but alert systems don't track this information. Like other forms of tank monitoring, these systems won't alert your oil supplier to low oil levels. You'll still need to make a last-minute call to keep your tank filled. Even if your budget prevents you from purchasing a monitoring system or automatic delivery service, you still need to check your oil to avoid running out of oil. Although experts discourage self-monitoring your oil levels, you can check your tank manually as a last resort by evaluating the gauge and contacting an oil supplier when you notice low tank levels. Check your oil with a dipstick to determine how full your tank is. Before it reaches one-quarter full, contact your oil provider to request a refill. Make sure oil levels never dip below the one-fourth mark to ensure that you won't run out of fuel or damage your tank. Manual monitoring is initially the most cost-effective option. However, you may end up paying more over time, especially if you forget to check your oil levels throughout the year. Even the most responsible homeowners can forget about their heating oil or propane, especially during a busy holiday season. While most prevention methods alert you when oil levels are low, manual monitoring relies on you to check your own oil levels often. Failure to check your tank could result in an emergency fill-up and costly repairs. Manual monitoring is the most inconvenient monitoring method, particularly for outdoor tank monitoring. During the coldest part of winter, the last thing you want to do is stand outside in the wind or snow while checking your oil tank. Maybe you have a monitoring system in place and always remember to order your oil on time. But oil monitoring isn't the only prevention method. And heating oil or propane loss isn't always caused by a failure to monitor your oil levels. Install a lock: If you notice your tank is depleting far quicker than usual, you might be a victim of heating oil theft. Secure your fuel in the tank by installing an alarm and lock system. While some smart meters come equipped with an anti-theft alarm, a separate lock cap can only be opened with a key and will actively keep out intruders. Perform regular inspections and maintenance: Leaks and blocked fuel lines can contribute to a massive loss of heating oil throughout the year. And with oil prices at an average of over $3 a gallon, it's more important than ever to protect your home from costly damage. Regularly inspect your tank and perform simple maintenance to prevent running out of fuel due to leaks or poor tank performance. Call an expert: If you notice a leak or any compromises in your system, contact an expert to assess any damages. You don't want to put off any necessary repairs or part replacements, as these repairs could prevent oil loss and increase the lifespan of your tank. Set aside an oil budget: Heating oil deliveries take a significant chunk out of your wallet. Ease the burden of expensive oil costs by setting aside money throughout the year dedicated to your next oil fill-up. You'll give yourself and your family peace of mind, and you'll be able to pay for your oil exactly when you need it. Monitor current and historical trends: Sometimes it's more cost effective to buy oil even before you need it. Oil prices rise and fall due to global economic trends, and you'll want to pay attention to these trends to determine the best time to buy your oil. Buying during the off-season or when prices are historically low ensures that you won't end up with a hefty bill during the winter peak season. But if you're already out of oil, preventive measures won't help you put fuel back into your empty tank. While you should take steps to avoid similar problems in the future, you need to take action immediately to restore your home's heat. Order an emergency delivery service: Emergency fuel delivery services can provide you with a necessary fill-up in less than 24 hours of your order. Heat your home with a substitute: If you run out of heating oil, you can use either kerosene or diesel fuel to hold you over until emergency services arrive. Just fill a gasoline-safe container with five to 10 gallons of fuel at a nearby gas station. Alternatively, you can use space heaters or a fireplace to heat your home until you receive more fuel. Insulate your surroundings: Make sure excess heat stays trapped in your home as you wait for oil to arrive. Tightly close windows and doors, and insulate with weather stripping wherever possible to minimize heat loss. When you're looking for a supplier that will help you avoid running out of heating oil, you need someone you can rely on. After all, not just any company will give you reliable service and honest prices exactly when you need it. Keep your tank full all year long when you trust Smart Touch Energy to supply your oil. You'll never run out of heating fuel again with our popular automatic delivery program. When you sign up for automatic delivery, you'll immediately receive a discount of $0.03 per gallon on all orders. Or, if you've already run out of oil, our emergency delivery service will be at your door typically less than 24 hours after you call. At Smart Touch Energy, we believe you deserve the best possible service that will keep you coming back without the need for restrictive contracts or hidden fees. We invite you to place an order to see the difference we can make for you and your home. We offer heating oil services throughout the Northeast. Check out a list of our service areas to find current pricing for your region and place an order. We look forward to showing you why we're your best choice for your heating oil needs. © 2018 Smart Touch Energy. All rights reserved.